The online retailer’s updated employment total of 541,900 workers seals Amazon’s position as the second-largest U.S. private-sector employer behind rival Wal-Mart. 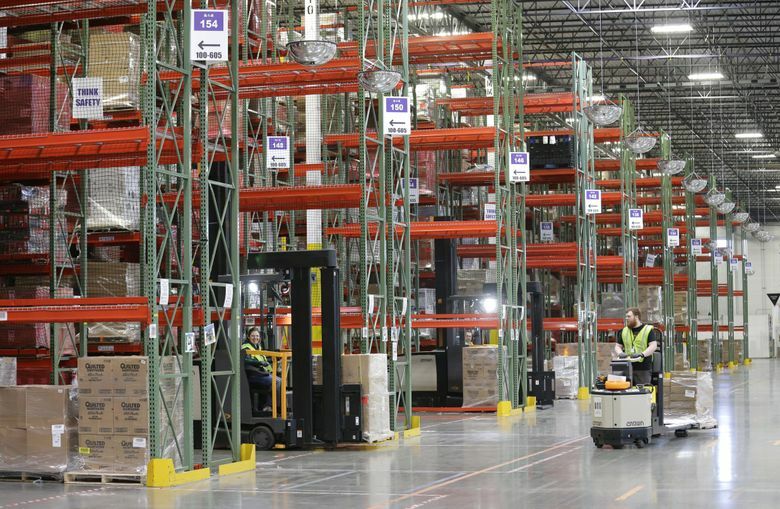 The latest milestone in Amazon’s expansion: The online retailer, after scooping up Whole Foods Market and going on a nationwide warehouse hiring binge, now has about as many employees as Seattle had residents in 2000. The Seattle company’s updated head count was disclosed in financial results for the three months ended in September — another period of breakneck growth that saw the company expand its reach into new corners of retail. The strong quarterly results pushed Amazon stock above $1,000 a share, nearing a record high, in after-hours trading Thursday. The updated employment total of 541,900 workers seals Amazon’s position as the second-largest U.S. private-sector employer behind rival Wal-Mart, which employs 2.3 million people. A little more than half the growth in Amazon’s ranks came from the acquisition of Whole Foods, which was finalized in August. The company also brought on thousands more to staff its warehousing and logistics groups. Amazon is building depots and distribution centers at a rapid clip to get closer to big cities to cut down on package delivery times, and meet the growth the company expects in its already commanding share of online commerce. Amazon is also building its high-tech businesses, hiring to staff its cloud-computing unit and expanding its ambitions in consumer electronics with last month’s announcement of a range of new Echo-branded devices. All that investment put a lid on Amazon’s profit during the third quarter. Amazon posted net income of $256 million, or 52 cents a share — the same per-share profit as it tallied in the year-ago period. Amazon tends to plow most of the cash it generates into its business, betting investment now will pay off in market share and loyal customers later. That there was any profit to report was again thanks to Amazon’s cloud-computing unit, the dominant player in the growing sector of selling on-demand technology infrastructure and software to businesses of all sizes. Amazon Web Services posted sales of $4.5 billion, up 42 percent from a year earlier. The group’s operating income — $1.1 billion — was more than ten times the total posted by Amazon’s North American retail unit. The quarter also included $1.3 billion in sales contributed by Whole Foods stores. Amazon closed its $13.5 billion deal to acquire the organic retailer on Aug. 28. Since then, the company has cut prices on some items, added Whole Foods-branded products to Amazon’s retail website, and says it will link the grocer to its Prime membership program. Amazon’s revenue was a record $43.7 billion during the quarter, up 34 percent from a year ago and narrowly surpassing Amazon’s holiday-season quarter last year. Analysts surveyed by Thomson Reuters had expected revenue of $42.1 billion, and per share profit of 3 cents, though some of those estimates didn’t take into account the contribution from Whole Foods. Amazon shares soared 8 percent, to $1,050.02, in after-hours trading.The stock had closed regular trading Thursday down less than 1 percent, at $972.43 a share. Amazon’s stock first surged above the $1,000 mark in May, and hit a high of $1,052.80 in July.